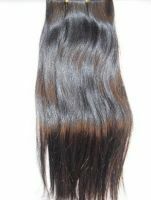 Chinese virgin hair is known for its sleek manageability and strength. It's slightly coarser and the hair follicles are thicker. Chinese hair is sleek and manageable. Consistent quality. Chinese hair is naturally straight and does not wave up after being wet. Extremely strong hair. Can be processed from virgin near black to platinum blond. The only hair type that can withstand extreme processing without degrading the hair quality . Excellent for silky stright hair styles.